Satyajit Ray adapts two short stories by Nobel Laureate and fellow cultural treasure Rabindranath Tagore. Two Daughters has long been recognized as one of his best works with The Postmaster singled out for praise by critic Pauline Kael and film-maker Wes Anderson (Rushmore). 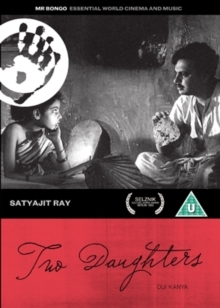 Satyajit Ray adapts two short stories by Nobel Laureate and fellow cultural treasure Rabindranath Tagore. Two Daughters has long been recognized as one of his best works with The Postmaster singled out for praise by critic Pauline Kael and film-maker Wes Anderson (Rushmore). In The Postmaster, the Calcutta-bred Nanda (Anil Chatterjee) performs the titular function in a malaria-stricken village. Alone and bored he forms a bond with his servant Ratan (Chandana Bannerjee). An orphan girl-child, Ratan is moved by her master’s kindness while her sweet nature leads Nanda to promise to teach her literacy even as he longs to return home. Conclusion tells the story of an ill-matched couple. When asked by his mother on his choice of bride Amulya (Soumitra Chatterjee) chooses Mrinmoyee (Aparna Das Gupta), the village tomboy. The resulting marriage proves disastrous, exploding in a bitter fight on their wedding night. Amulya withdraws from the village, promising to return only when his wife calls for him, leaving his mother heartbroken and Mrinmoyee reeling with guilt. In The Postmaster, the Calcutta-bred Nanda (Anil Chatterjee) performs the titular function in a malaria-stricken village. Alone and bored he forms a bond with his servant Ratan (Chandana Bannerjee). An orphan girl-child, Ratan is moved by her master’s kindness while her sweet nature leads Nanda to promise to teach her literacy even as he longs to return home. Conclusion tells the story of an ill-matched couple. When asked by his mother on his choice of bride Amulya (Soumitra Chatterjee) chooses Mrinmoyee (Aparna Das Gupta), the village tomboy. The resulting marriage proves disastrous, exploding in a bitter fight on their wedding night. Amulya withdraws from the village, promising to return only when his wife calls for him, leaving his mother heartbroken and Mrinmoyee reeling with guilt.